Setting up an interview with Professor Jim Bryan was not an easy task. I found myself waiting outside of Brownson 106 where he teaches Principles of Microeconomics for 10 minutes after the class ended. Afraid that I might miss him, I looked inside the classroom only to find him engaging in a spirited conversation with several students. During Bryan’s career which spans nearly 30 years at Manhattanville College, this is not the only indicator of his dedication to teaching. He has a busy schedule, which was evident when he flipped through his agenda to find a date for our talk, because he is always willing to make appointments with students who would like to discuss their studies and concerns. Looking at a pile of thank you notes that were scattered on his office desk, one can see the influence that Bryan has had on Manhattanville students over the years, both academically and personally. 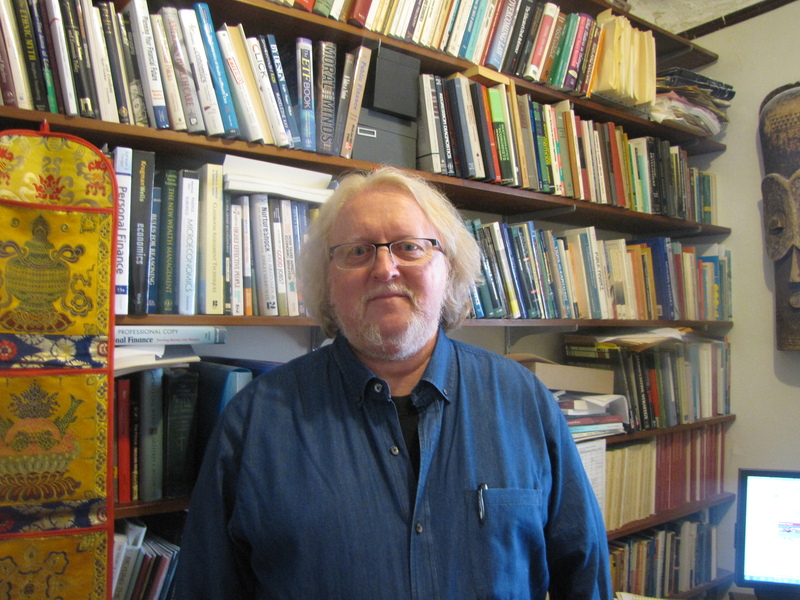 Bryan comically described his path to his career in teaching as being “produced by a variety of accidents rather than visions.” Even though he is now a Professor of Economics, his undergraduate studies in the Great Books Program at University of Notre Dame focused on history, literature and philosophy. Bryan was attracted to the concentration due to his interest in major traditions of Western intellectual thoughts. Growing up, Bryan’s father kept a set of 52 volumes of great books of the Western world, which could also have contributed to his passion. After college, he went to University of Virginia to study a completely different field and earned a Ph.D. in Economics. Professor Bryan participating in #GivingTuesday. Since coming to Manhattanville in 1984, Bryan has played an active role in making valuable changes at the College, especially in terms of academics. He was the Dean of Studies at Manhattanville from 1987 to 1991. In this position, he enjoyed working with individual students and chairing a committee to develop proposals for curriculum reform. Bryan found the advising aspect of the position to be the most rewarding. Bryan then became Provost of the College from 1991 to 1997 and he is now the Chair of the Core Curriculum committee. Aside from being an advisor to majors in his department, he is also a first-year advisor to freshmen in his seminar class called “To Be Human…” With no focus on economics, the class is an extension of Bryan’s own interest in human nature. The course materials range from biological examination to psychological research of human behaviors, which sharply contrast economics’ extremely simplistic view of human beings as creatures who are able to make decisions rationally. While the class does not specifically cater to economics majors, Bryan believes that students who are interested in the field can find the materials enlightening. Bryan also shared that being a first-year advisor is significantly different from working as an Economics advisor. Freshmen are usually unsure of their academic and professional options and he will assist students in figuring out their own strengths and transitioning either from high school to college or from one culture to another. Bryan’s favorite part of teaching is interacting with students and helping them not only understand difficult concepts but also make these theories part of their own thinking. His least favorite part, however, is grading, which he considers rather antisocial to converse with a blue book or an essay. As a result, Bryan has sometimes offered students an option to take oral tests in certain classes to engage students and fully understand their academic perceptions. Indeed, over the years, Bryan has always maintained a close relationship with his students. He personally holds study sessions in the evening to be sure students are well-prepared for upcoming tests. His office is full of memorabilia and gifts he has received from students from all over the world. He also keeps in touch with alumni; even those who preceded his time at Manhattanville College. He credits the small college environment at Manhattanville for enabling him to play a more significant role in students’ lives. If you have any unforgettable memories of Professor Bryan during your time at Manhattanville College, or to request another faculty spotlight, please share with us in the comment section! Prof Bryan, an incredible human being. Reading this spotlight makes me want to go back to school and learn how “to be human”. I had many great Professors during my time at Mville, and just a few that change who I am and how I think… Prof. Bryan was one of these few. Professor Bryan has been an inspiration and a great counselor throughout college and beyond. Even though he might be very busy, he will always find time to help you out. He is dedicated and committed. He has had a great impact in the way I see the world. Thank you Professor! Prof. Bryan set the bar for me in terms of what to academically and professionally expect from others as well as myself. His concern for his students both inside and outside the classroom made all the difference! He was a wholehearted adviser and mentor for me and many of my peers who always went above and beyond his obligations. He never failed to challenge us academically and was always available to answer our concerns or lend an ear when in times of need. Thank you Prof. Bryan for all you did for me! Great spotlight! He is even busier now than he was during my time at Mville. He is the best professor and counselor. So happy he is still part of Mville and teaching even more classes.